Facial hair threading is starting to become a popular alternative within United States to plucking and waxing for the facial hair. This technique using a string to remove hair passed down through generations in eastern countries. It is becoming extremely popular here for many reasons, like being chemical-free and gentle to the skin. Also like tweezing it removes the entire hair follicle from the root, getting hair free results for weeks. Although you would think using a string sounds like a long process, it's very fast. Sensitive skin, after peeling treatments cannot handle waxing. Lot of Dermatologists recommend threading over waxing. Threading is only performed on the face and not on the body. 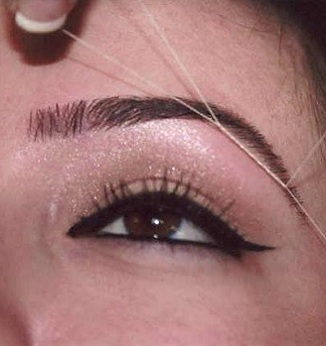 Threading reduces facial hair and exfoliates skin which results in smooth skin and make up flows perfectly. How Does it Work So Fast? The process uses a cotton string in a twisting motion, to trap hair in a mini lasso that pulls up each hair right out of the follicle as it passes along the skin. An artful technique, that's amazing to watch. It's faster than waxing because it doesn't require much prepping of the skin, applying product or strips. The speed can't even compare to the monotonous chore of tweezing, who has time for that? Just as our body needs preventive care and treatment to keep us healthy, so does our scalp & hair. We offer the following specialty treatments to rejuvenate your scalp & hair.